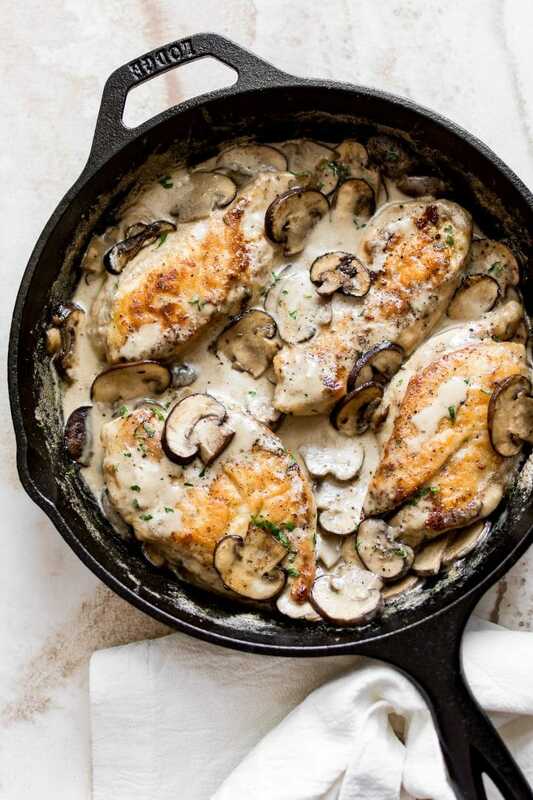 This creamy mushroom chicken recipe has the most deliciously tender pan-fried chicken smothered in a garlicky mushroom sauce. It’s quick and easy – it can be on your table in half an hour. My creamy chicken recipes are some of my readers’ favorites. In particular, my creamy garlic chicken recipe is well-loved. A lot of readers have added mushrooms to it, and that made me think that I should really include a creamy mushroom chicken recipe on here. My creamy white wine chicken recipe is also similar and you may like it. Prep and sear your chicken: Cut your chicken breasts in half lengthwise, then coat the chicken cutlets in flour and sear them for 4-5 minutes/side until golden. Cook the mushrooms: Take the chicken out of the pan and then cook the mushrooms with the garlic. Make the sauce: Take the mushrooms out of the pan and add the chicken broth, lemon juice, and Dijon mustard. Let it reduce the add the cream. Finish cooking the chicken and thicken the sauce. This should only take 5 minutes or so; you don’t want to overcook the chicken. As always, my trick to tender chicken is cutting the chicken breasts in half lengthwise so they cook faster and don’t get all tough. You could also pound them thin if you prefer! Pro tip: I love including Dijon mustard in recipes like this for extra flavor, but it’s not a dealbreaker. If you don’t have any, you can for sure leave it out. Another thing you can do is replace the chicken broth with white wine if you have some on hand. What kind of mushrooms to use? I used baby bellas (baby portobello mushrooms), but white mushrooms, cremini, or whatever you’ve got or the store has will be fine. This recipe goes great with mashed or roasted potatoes, rice, pasta, or keep it low-carb and eat it with steamed veggies! 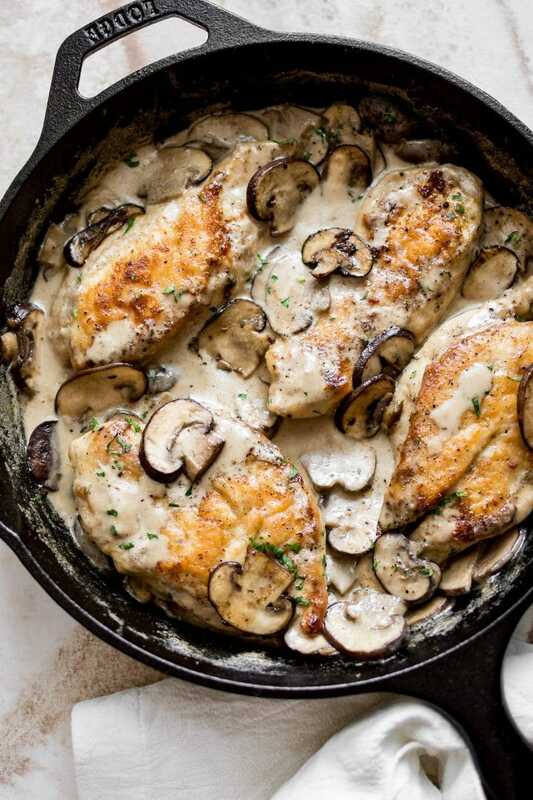 Love chicken and mushroom recipes? You may also like my chicken bacon mushroom pasta or my chicken and mushroom soup recipe. 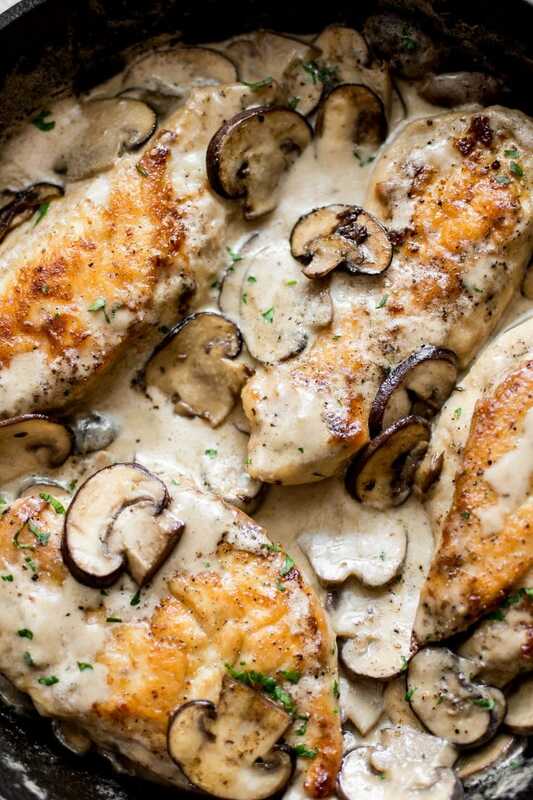 Will you make this creamy garlic mushroom chicken recipe? This creamy mushroom chicken recipe has the most deliciously tender pan-fried chicken smothered in a garlicky mushroom sauce. It's quick and easy - it can be on your table in half an hour. Cut your chicken breasts in half lengthwise to make four thinner cutlets. Coat them in flour. Add the oil and 1 tablespoon of the butter to a skillet over medium-high heat. Once the pan's hot, add the chicken. Cook it for 4-5 minutes/side until golden. Once this step is done, take the chicken out of the pan and set it aside. Chop the mushrooms while cooking the chicken. Add the remaining butter to the pan. Let it melt, then add the mushrooms and Italian seasoning. Once the mushrooms start to release water, add the garlic to the pan. Continue cooking the mushrooms until all the water is cooked off. 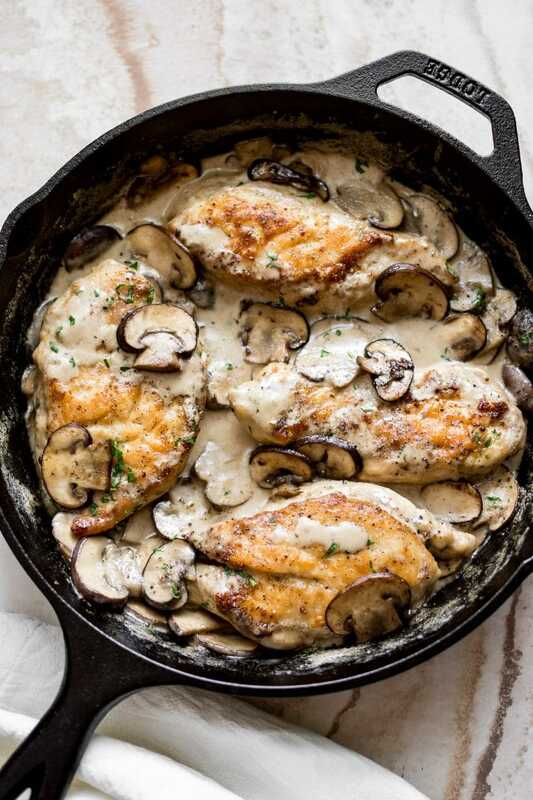 Take the mushrooms out of the pan (ok to put them on the same plate as the chicken). Add the chicken broth, lemon juice, and Dijon mustard to the pan. Give it a good stir until the mustard dissolves, and let it reduce for 3-4 minutes. Add the cream to the pan, along with the chicken and mushrooms. Let the chicken cook for another 5 minutes or so until it's cooked through and the sauce has thickened a bit. Season with salt & pepper as needed. This looks just mouthwatering Natasha! Tom and I would both enjoy it! Can I replace the cream with anything healthier? Hi! You could, but it won’t be the same recipe. Half-and-half or milk will make the sauce thinner and I can’t guarantee it’ll taste as good unfortunately. Could you use Greek yogurt? Hi Sandra! You could try, but I’ll be honest… the sauce won’t be the same. Coconut milk could work too, but it’ll give it a different texture and a coconutty taste. Yogurt will make it a bit tangy and I can’t say how exactly it’ll end up unfortunately. If you’re trying to substitute to cut calories, I’d probably just reserve this dish for when you feel like splurging a little haha… that’s what I do. So happy you liked it, Jane!